Steve and I are leaving town to spend a few days in Santa Barbara. It’s our final pre-baby vacation, which was highly recommended by many of our friends with kids. It will be a while before we can do something like this after the baby arrives. We’ll be staying at an elegant bed and breakfast (a first for both of us!) right in town. Goodbye crazy city of LA, hello beautiful Santa Barbara. But before I go, here’s a recipe for you. This bread is named for Gallagher’s Cove on Catalina Island, California, a place that I’ve visited many times. Some great cooks out there made this bread famous, and this post is in honor of them. 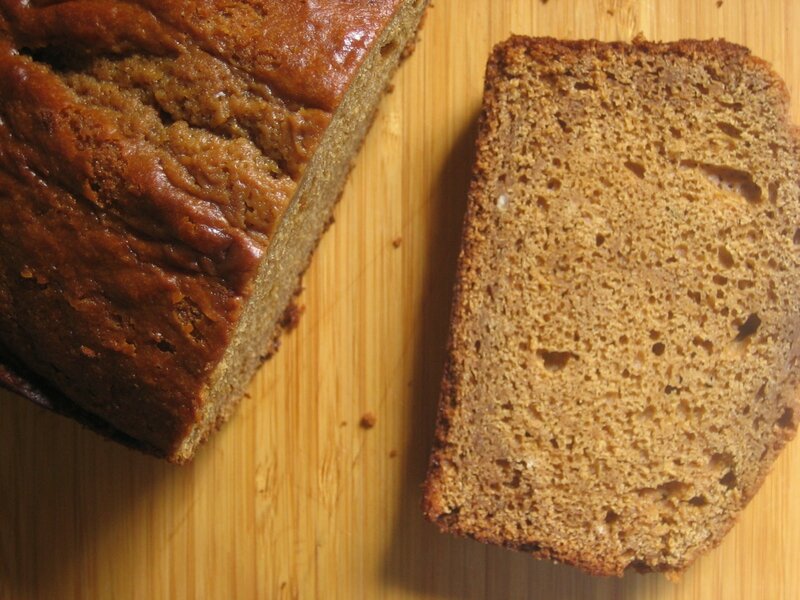 The bread is sweetened with molasses, and tastes wonderful with butter or whipped cream cheese. It’s easy to make, and keeps for several days. The recipe makes two loaves – one can be enjoyed immediately, and the other can be frozen for later! Combine milk and vinegar. Combine butter, brown sugar, eggs and molasses. While mixing on low, add 1/2 of milk mixture. Mix on medium for 1 minute. Add rest of milk mixture. Mix on low, and add flour and baking soda. Divide evenly into 2 greased loaf pans. Bake at 350 degrees for 50 minutes. Can I Blame It On Pregnancy Brain? The bread looks beautiful! Enjoy your trip. I love Santa Barbara. My cousin got married in Santa Barbara. If you can look beyond the sometimes brazenly drunk college kids, it’s actually an adorable town with gorgeous views of the ocean. Have a wonderful time away! Have a wonderful time. And the bread looks good! Thanks for the recipe and enjoy your vacation! yum, this bread is great. i used blackstrap molasses (extra high in iron) and my bread came out black like chocolate cake.